Last week I spent a morning with Rod Dixon, head boatman on Upper Dryburgh. 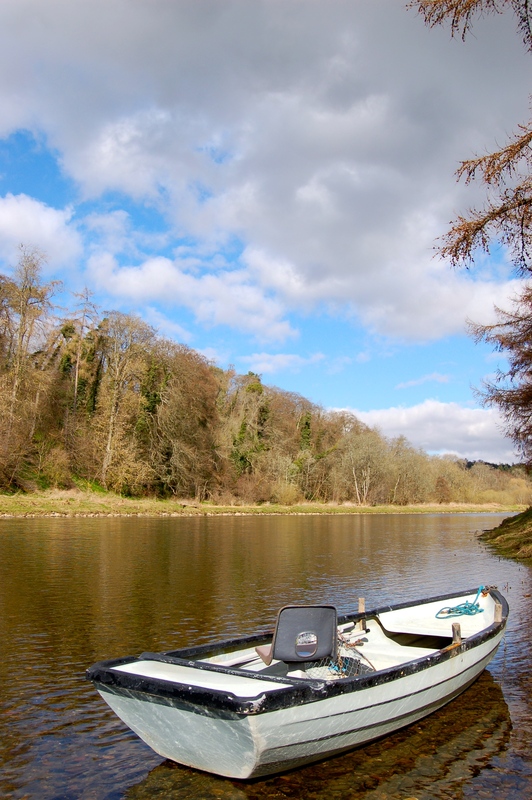 Until recently Upper Dryburgh was part of the rotation with Dryburgh North and as a result it has been lightly fished during the last five years. I walked the beat with Rod who described each pool and its good taking spots with enthusiasm. The beat can offer fishing in all water heights from summer lows at 3″ on the gauge all the way up to 2ft 6″ and above. The water was gin clear and did look very fishable. In lower water conditions the river allows you to see its secrets, rocks and lies where fish are likely to be. You can learn an awful lot about a beat when you fish it in low clear water. Rod had no anglers fishing the day I met him but beats above and below caught fish that day. Walking along this one mile stretch of lovely double bank fishing we reached its uppermost pool, the Monksford. The pool fishes best from the south bank at normal heights as it is slightly deeper on the far side, with lots of stones. In lower water it can be fished from the opposite bank and is an easy wade. Wading down the North side can be a tricky if the river is carrying a bit water. At the tail of the pool there is a lovely fast channel on the North bank which does hold grilse. This is the ‘go to’ place when the day is hot and bright as you can often pick up a fish. Battery pool is a deep fast run off the battery wall and offers sport to the fly and spinner. Fence end is about 8 to 12ft deep and can hold fish. The Concrete Croy and Todd Hole are a scour channel where fish lie in the tail. The Mungie is a long crescent shaped glide with swirls which are very inviting. A very easy gravel wade on the inside is good for anglers who like to wade but are not that confident. This pool can hold a lot of fish in the Autumn and the depth is such that if you can cast a decent line across the pool the fish will see the fly. Bridge pool is the best low water pool on the beat. It is very turbulant fast water and on a summer’s day this is one of the places you would expect to get a fish. People do spin it, but it does not normally fish well above 1ft 6″ on the gauge. Below this it can be fished with confidence. The boat pool is a fast run down into Hotel pool. The pool at the corner has a washing machine effect with a back eddy which takes a bit of working out. Novices, and those new to the beat, need some guidance to miss unproductive parts. The bottom pool is the Hotel pool. The Lower Dryburgh catches are an indication of the quality of fishing that the beat provides.